Originally published as “Philippe Petit: Slow Dancing on the High Wire” in the October, 1986 issue of New York Woman, this feature appears here with permission from the author. The first time I saw Philippe Petit he was walking an imaginary line across the floor of the Cathedral of St. John the Divine. He was pale, slight, and red-haired, and he held his jaw and his balancing pole with fierce concentration. A few nights later, I saw him perform the same routine 100 or so feet in the air, on a high wire strung through the nave of the stone cathedral. Petit had choreographed the work in honor of the 100th birthday of St. John’s, and he performed it with inspiration—a kind of slow dance on a high wire without a net to the accompaniment of a piano and a saxophone played by Paul Winter. Petit shed his tunic up there and did the second half of his act in an old-fashioned men’s white T-shirt. Every so often, he grinned hugely at our upturned faces. Near the end of the evening, he stretched out his back on the wire and, in a state of what looked like repose, languidly dropped gold sequins onto the stone floor below. I mobbed him with the rest of the crowd in the gift shop afterwards. Petit is medium short, about 5-foot-5, 37 years old, with rough, peasantlike features. He looks almost medieval in a vaulting cathedral. But he grew up in Paris and has business cards that give a Paris address as well as the address of St. John the Divine, where he is an artist-in-residence. I got a card and an autograph and confirmed our appointment. Petit also scrawled out for me the number of his girlfriend, Elaine Fasula, who lives downtown with their four-year-old daughter, Gypsy. “I have an unconventional family,” he explained to me later. No doubt things are complicated by the fact that dad lives in a cathedral. The truth is, Petit was intense on the wire but also warm and personable; during the autographing session, he was distracted, almost irritable. Too many Upper West Side artiste-lovers were trying to connect with him. One day, he is going to quit giving out his business cards. But such was the power of his performance that I began to notice small, fit, red-haired men everywhere. Later that evening, I caught a train to the suburbs but fell asleep and missed my stop; when I awoke, the train was pulling into a place called Valhalla. I’ll catch a cab from here, I thought; but there was no phone in the Valhalla station. It was after midnight, and the whole town was locked up and dark. I walked around in the rain for a while and considered breaking into the drugstore. That was when a small, fit, red-haired boy came walking through the rain, took pity on me, and escorted me back to a church which he had just set up for bingo. He kept me company until the cab came, and I told him this was my second church in one evening. In the first, I’d seen a high-wire performance act. The boy was polite, but skeptical. 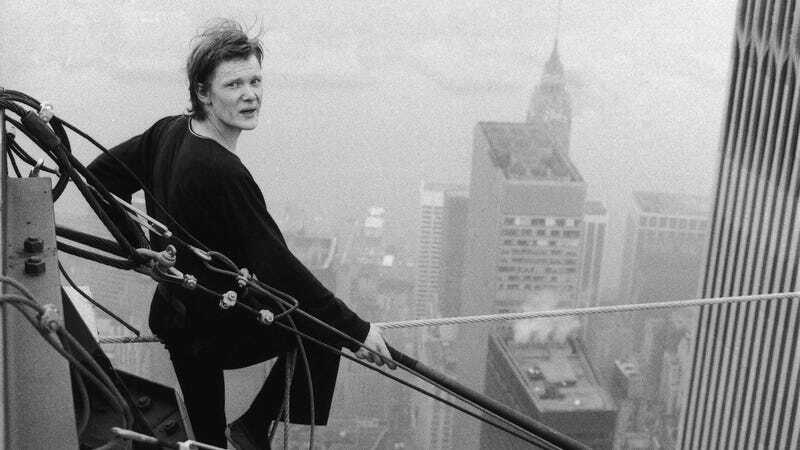 Not until I was safe at home did it occur to me that I’d been rescued by Philippe Petit’s doppelganger. Petit wears a white, billowy shirt and holds his head at a dignified angle while trotting around the stable on a tired horse named Lorenzo. “Instantly nice,” he pronounces the experience of being on a horse. Outdoors, in the sunshine, both the aerialist and the horse trot a few blocks to the 90th Street entrance of Central Park with genuine interest. In only a few days, Petit must fly to Vancouver to walk a high wire across a lagoon, but he has graciously agreed to spend several hours with me. We stop at a little iron bridge by the reservoir, and Petit qualifies his happiness. “Oh, sure, it’s a little sad. He’s not a young horse, and he could use a good brushing. It’s not a beautiful park. There’s noise, and concrete, and pollution. But still…. It’s a gorgeous summer day in Central Park, and even the joggers seem happy. How can Petit resist? And in fact, people do seem to recognize Petit. When he first arrived in New York, he convened a media circus for a spectacular stunt: a walk on a high wire between the towers of the World Trade Center. That walk made him instantly famous, and a dozen years later, people still remember it. “You’re the wirewalker, right?” said the man who had handed us Lorenzo. The people skirting us smile, but don’t interrupt. A class of children from special ed squeezes past us on the bridge, squealing—but they’re squealing at the horse, not Petit. Petit holds himself stoically while they pass. I pull a red apple out of my pocket and shine it for Lorenzo. Petit bites into it, spits the pieces into his hand, then leans around to feed them to the horse. Lorenzo is clearly having a fine time serving such a sensibility; he cheerfully does whatever Petit wants: he trots, he stops, he stands around looking at the reservoir with pleasure. “You establish a current with a horse, see?” Petit says, backing him up over the cast-iron bridge. “When I was a boy, I met a Cossack acrobatic troop on the beach in Normandy, and they taught me some circus riding. It’s considered frivolous, but I think it’s a good part of classic horse education. I was serious about horses. I groomed, I taught, I did dressage, and I jumped,” he says. “Did you ever race?” I ask, thinking he could have been a jockey. He flicks a glance at me. “No,” he snorts. Later, he tells me things that I think relate directly to his pride, his tendency to sit very straight on a horse. “It’s an irony to be both poor and famous,” he says, “but that’s what I am. As far as money goes, I’m usually in a disaster situation, just barely afloat. I helped a benefit committee raise half a million dollars, but I couldn’t afford the taxi home. I get lots of offers to walk the high wire, but I choose what I say yes to. I’ve been a street juggler for 10 years; I go down to Washington Square Park on Saturdays and Sundays and, yes, I pass my hat. I sell drawings. I write articles and screenplays. I have no shame. Last winter, I demolished a house for $5 an hour. And I wash windows very well. “It’s in the cathedral gift shop,” I say. “I really liked the book,” I say. He shrugs. I mention a few of the things I admire about it, including a passage about how painful it is to lie with your back against the wire (“You will be a skeleton balanced on a razor blade”). I also liked the cover, which includes a photo of Petit in that position, looking relaxed. I fade back to the bridle path to chew on this while the photographer and his two assistants, who have been circling closer, swoop down on Petit and his steed. I stand under the bridge and listen to the clop, clop, clop of the horse and Petit saying, “Great shot! Good,” to the camera. Once more, I think, Petit is over my head. Lorenzo stamps a foot on the bridge. “He’s tired,” Petit announces, so our procession winds through the park to the stable; Petit vows to ride again. The wirewalker has an entire half hour free, and so do I, and so does his brother Alain, in from Paris to assist with the stringing of the cables across the Vancouver lagoon. “Let’s grab lunch,” says Petit, and the three of us race to West Side Storey. Alain and I order beer and salads; Petit orders fresh-squeezed orange juice, cold blueberry soup, and salad Niçoise with bleu cheese dressing. He seems a little too severe to have groupies, but I ask. Alain leans forward with his ears perked up and wants Philippe to translate. They have a rapid, serious dialogue in French about groupies, which I unfortunately do not understand. “You have what you deserve,” Petit finally says to me. “If you do a false dance with people who admire you, you have groupies. I have a sincere relationship with my fans. I respect them. I respect their interest in me.” Then he excuses himself to wash his hands. Alain and I try to make conversation in English. “What do your parents do?” I ask him. “Our mother does nothing,” Alain says. “Our father is a historian? An aviation writer? A dater of Air France, of its museum? A culinator of flight history?” He gives up when the food arrives. The Stacks is Deadspin’s living archive of great journalism, curated by Bronx Banter’s Alex Belth, who also runs Esquire Classic. Email us at thestacks@deadspin.com.